Observatory Stargazing – Autumn 2018 Open House Nights Mittelman Observatory and Middlebury Physics will again host stargazing open house nights this autumn. These Observatory events are scheduled for Friday evenings, September 14 and September 21, from 8:30 PM until 10:00 PM, weather permitting. Saturn and Mars will be in the evening sky on these dates. A variety of interesting stars, star clusters, and nebulae will also be visible through the Observatory’s telescopes. The Observatory includes a 24-inch telescope in a dome and smaller telescopes on the roof. Mittelman Observatory is located atop McCardell Bicentennial Hall on the west side of the Middlebury College campus. To reach the Observatory, follow Route 125 west from the Middlebury village center, through campus, and down the hill. Turn right on Bicentennial Way towards the parking lot, enter the building, and take the elevator to the 7th and top floor. Observatory open house nights are free and open to the public. However, these events will take place only if the sky is expected to be mostly clear. Please check the Observatory web site at http://go.middlebury.edu/observatory/ or call the Observatory at 443-2266 after 6:30 PM on the evening of the event for weather status. 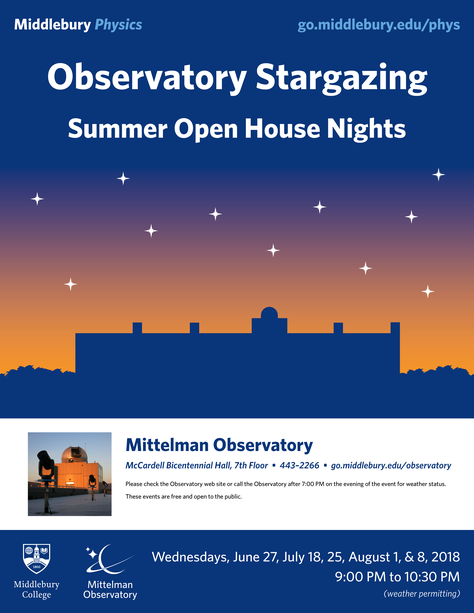 Observatory Stargazing – Summer 2018 Open House Nights Mittelman Observatory and Middlebury Physics will again host stargazing open house nights this summer. These Observatory events are scheduled for Wednesday evenings, June 27, July 18, July 25, August 1, and August 8, from 9:00 PM until 10:30 PM, weather permitting. Jupiter and Saturn will be in the evening sky on many of these dates. A variety of interesting stars, star clusters, and nebulae will also be visible through the Observatory’s telescopes. The Observatory includes a 24-inch telescope in a dome and smaller telescopes on the roof. Observatory open house nights are free and open to the public. As these are minimal language events, they are also appropriate for Language Schools students. These events will take place only if the sky is expected to be mostly clear. 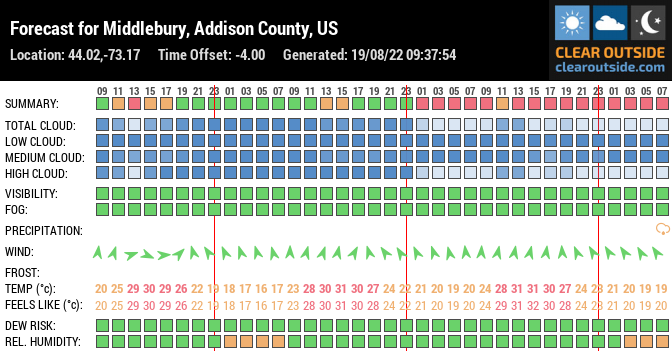 Please check the Observatory web site at http://go.middlebury.edu/observatory/ or call the Observatory at 443-2266 after 7 PM on the evening of the event for weather status. 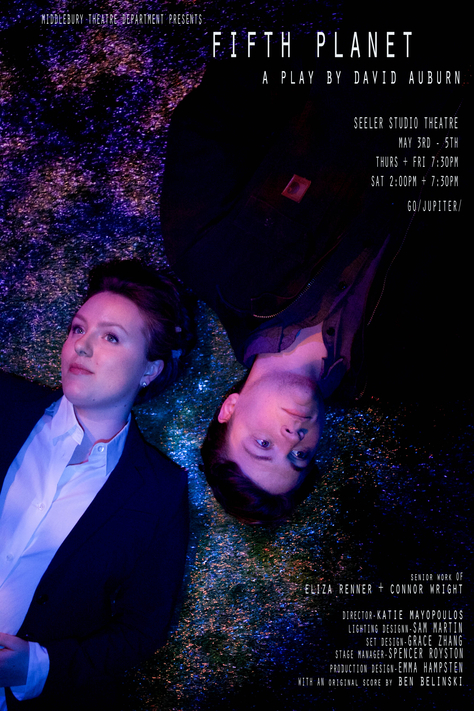 May 3 & 4 at 7:30pm, May 5 @ 2pm & 7:30pm. Seeler Studio Theatre, Mahaney Center for the Arts. Tickets $6, for all ages with some adult language. Observatory Stargazing – Spring 2018 Open House Nights Mittelman Observatory and Middlebury Physics will again host stargazing open house nights this spring. These Observatory events are scheduled for Friday evenings, April 27 and May 4, from 9:00 PM until 10:30 PM, weather permitting. A variety of interesting stars, star clusters, and nebulae will also be visible through the Observatory’s telescopes. The Observatory includes a 24-inch telescope in a dome and smaller telescopes on the roof. Observatory Stargazing – Autumn 2017 Open House Nights The Mittelman Observatory and Middlebury Physics will again host stargazing open house nights this autumn. These Observatory events are scheduled for Friday evenings, September 15, September 22, and October 6, from 8:00 PM until 9:30 PM, weather permitting. Saturn will be in the evening sky on many of these dates. A variety of interesting stars, star clusters, and nebulae will also be visible through the Observatory’s telescopes. The Observatory includes a 24-inch telescope in a dome and smaller telescopes on the roof. The Mittelman Observatory is located atop McCardell Bicentennial Hall on the west side of the Middlebury College campus. To reach the Observatory, follow Route 125 west from the Middlebury village center, through campus, and down the hill. Turn right on Bicentennial Way towards the parking lot, enter the building, and take the elevator to the 7th and top floor. Observatory open house nights are free and open to the public. However, these events will take place only if the sky is expected to be mostly clear. Please check the Observatory web site at http://go.middlebury.edu/observatory/ or call the Observatory at 443-2266 after 6 PM on the evening of the event for weather status. 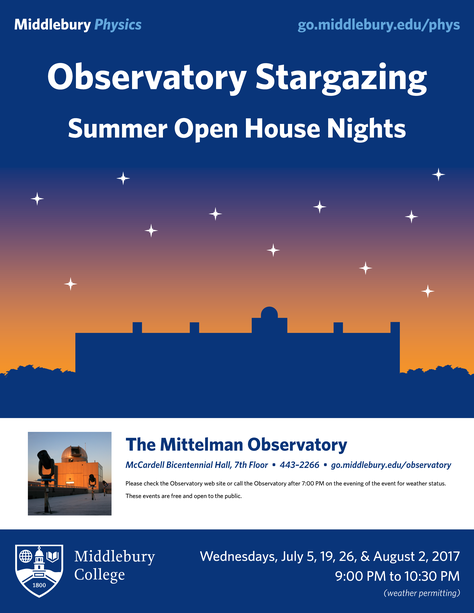 Observatory Stargazing – Summer 2017 Open House Nights The Mittelman Observatory and Middlebury Physics will again host stargazing open house nights this summer. These Observatory events are scheduled for Wednesday evenings, July 5, July 19, July 26, and August 2 from 9:00 PM until 10:30 PM, weather permitting. Observatory Stargazing – Spring 2017 Open House Nights Middlebury College Observatory and Middlebury Physics will again host stargazing open house nights this spring. These Observatory events are scheduled for Friday evenings, April 28 and May 5, from 9:00 PM until 10:30 PM and are weather permitting. Jupiter will be in the evening sky on these dates. A variety of interesting stars, star clusters, and nebulae will also be visible through the Observatory’s telescopes. The Observatory includes a 24-inch telescope in a dome and smaller telescopes on the roof. Observatory open house nights are free and open to the public. However, they will take place only if the sky is expected to be mostly clear. Please check the Observatory web site at http://go.middlebury.edu/observatory/ or call the Observatory at 443-2266 after 7 PM on the evening of the event for weather status. Observatory Stargazing – Autumn 2016 Open House Nights Middlebury College Observatory and Middlebury Physics will again host stargazing open house nights this autumn. These Observatory events are scheduled for Friday evenings, September 16 and September 30, from 8:00 PM until 9:30 PM and are weather permitting. Observatory open house nights are free and open to the public. However, they will take place only if the sky is expected to be mostly clear. Please check the Observatory web site at http://go.middlebury.edu/observatory/ or call the Observatory at 443-2266 after 6 PM on the evening of the event for weather status. Observatory Stargazing – Summer 2016 Open House Nights Middlebury College Observatory and Middlebury Physics will again host stargazing open house nights this summer. 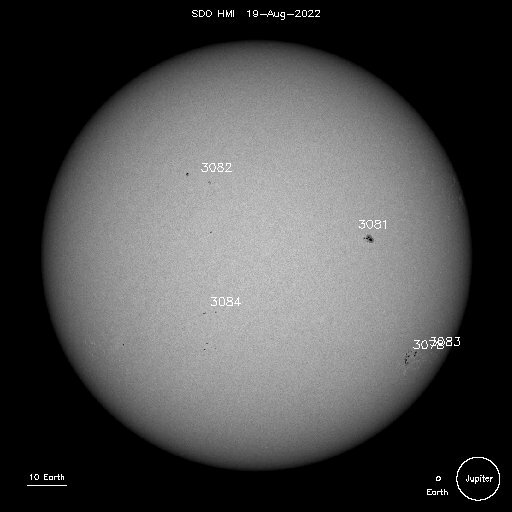 These Observatory events are scheduled for Wednesday evenings, June 29, July 6, 20, 27, and August 3, from 9:00 PM until 10:30 PM and are weather permitting. Jupiter, Saturn, and Mars will be in the evening sky on many of these dates. A variety of interesting stars, star clusters, and nebulae will also be visible through the Observatory’s telescopes. The Observatory includes a 24-inch telescope in a dome and smaller telescopes on the roof. 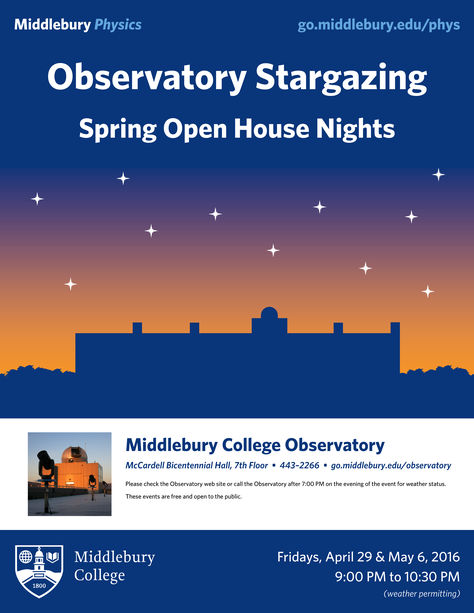 Observatory Stargazing – Spring 2016 Open House Nights The Physics Department at Middlebury College will again host Open House nights at the College Observatory this spring. The observatory, located atop McCardell Bicentennial Hall, will be open to the public for viewing the heavens on Friday evenings, April 29 and May 6, from 9:00 PM until 10:30 PM, provided the skies are mostly clear. McCardell Bicentennial Hall is located on the western edge of the College campus. Follow state Route 125 west from the Middlebury village center, through the campus. Approximately 0.1 mile past the crest of the hill, turn right at the base of the hill onto Bicentennial Way, which leads to the parking lot. Enter the building and take the elevators to the top (7th) floor. All observatory public nights are free and open to the public, but will take place only if the sky is at least mostly clear. If the weather appears uncertain, visitors may call the observatory at 443-2266 or visit the observatory web site after 7:00 PM on the evening of the Open House for a status report. More information can also be found at go.middlebury.edu/observatory . 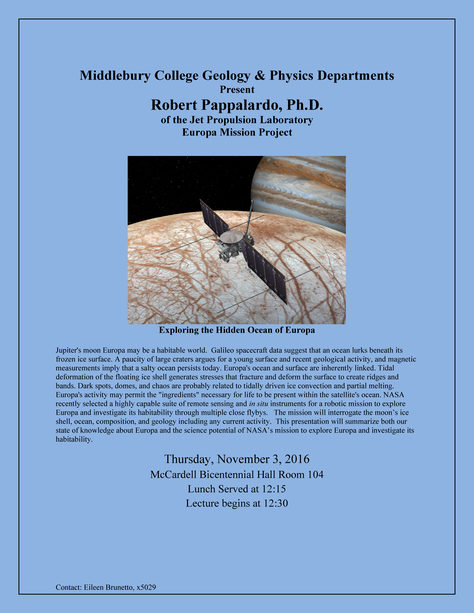 Observatory Stargazing – Autumn 2015 Open House NightThe Physics Department at Middlebury College will again host an Open House night at the College Observatory this autumn. The observatory, located atop McCardell Bicentennial Hall, will be open to the public for viewing the heavens on Friday evening, October 9, from 8:00 PM until 9:30 PM, provided the skies are mostly clear.Visible through our telescopes will be a number of interesting stars, star clusters, and nebulae. There is no set program for the Open House nights; the public is invited at any time between 8:00 PM and 9:30 PM. All observatory public nights are free and open to the public, but will take place only if the sky is at least mostly clear. If the weather appears uncertain, visitors may call the observatory at 443-2266 or visit the observatory web site after 6:00 PM on the evening of the Open House for a status report. 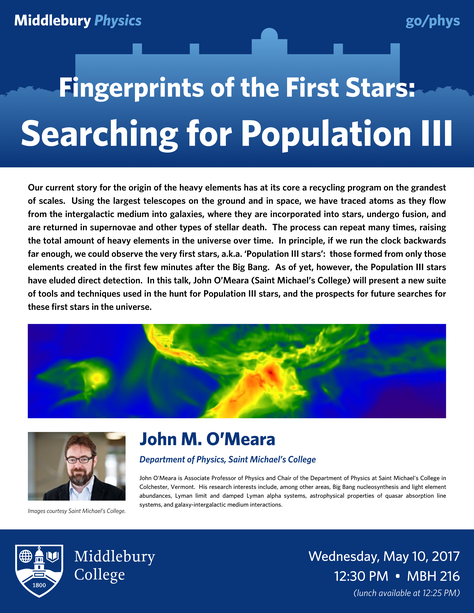 More information can also be found at http://sites.middlebury.edu/observatory/ . Lunar Eclipse – 2015 September 27The Physics Department at Middlebury College will host viewing of the upcoming total lunar eclipse at the College Observatory. The Observatory, located atop McCardell Bicentennial Hall, will be open to the public for viewing the moon on Sunday evening, September 27, from 8:30 PM until 10:30 PM, provided the skies are mostly clear.Viewing of the lunar eclipse will happen from the roof deck with smaller telescopes as well as with the unaided eye. 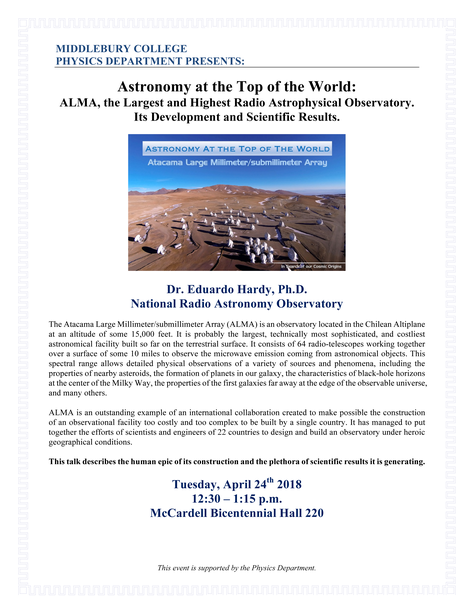 Please note that for this event, the larger computer-controlled 24-inch telescope in the Observatory dome will not be available. The moon is best appreciated with the larger field of view of a smaller telescope or without any telescope at all. The larger telescope is scheduled to be available for stargazing during a subsequent public open house night this fall. This Eclipse Viewing at the Observatory is free and open to the public, but will take place only if the sky is at least mostly clear. If the weather appears uncertain, visitors may call the observatory at 443-2266 or visit the Observatory web site, after 6:30 PM on the evening of the Eclipse Viewing for a status report. 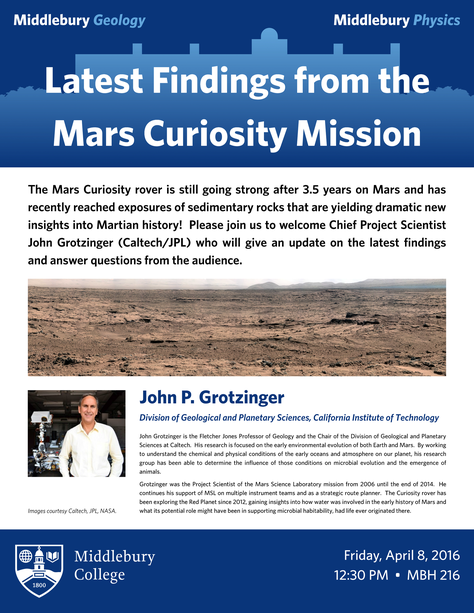 More information can also be found at http://sites.middlebury.edu/observatory/ . Observatory Stargazing – Summer 2015 Status UpdateThe Physics Department at Middlebury College is performing upgrades at the College Observatory and will not be having Open House nights this summer.Over the years, Open House nights at the Observatory have been popular events on the Middlebury campus during the summers as the Observatory has opened its doors to the College community and the public to share the wonders of the night skies. Thanks to generous support from the Michele and David Mittelman (’76) Family Foundation, the Observatory will be undergoing substantial renovations and modernizations that represent a fundamental commitment to the long-term future of the Observatory, both for curricular and research uses, as well as for outreach. These improvements to the Observatory will help ensure that Middlebury students, College community members, schoolchildren, and the public will continue to be able to explore the universe on the Middlebury campus under dark Vermont skies. The current expectation is that the Observatory will again be operational in the fall after completion of the upgrades. 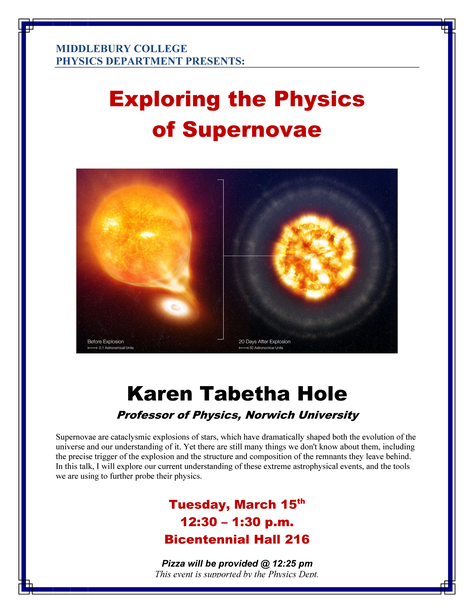 Observatory Stargazing – Spring 2015 Open House NightsThe Physics Department at Middlebury College will again host Open House nights at the College Observatory this spring. The observatory, located atop McCardell Bicentennial Hall, will be open to the public for viewing the heavens on Friday evenings, May 1 and May 8, from 9:00 PM until 10:30 PM, provided the skies are mostly clear.Jupiter and Venus will be in the evening sky on both of these dates, while the moon will be visible only on the first of these two evenings. Also visible through our telescopes will be a number of interesting stars, star clusters, and nebulae. There is no set program for the Open House nights; the public is invited at any time between 9:00 PM and 10:30 PM. McCardell Bicentennial Hall is located on the western edge of the College campus. Follow state route 125 west from the Middlebury village center, through the campus. Approximately 0.1 mile past the crest of the hill, turn right at the base of the hill onto Bicentennial Way, which leads to the parking lot. Enter the building and take the elevator to the top (7th) floor. All observatory public nights are free and open to the public, but will take place only if the sky is at least mostly clear. If the weather appears uncertain, visitors may call the observatory at 443-2266 or visit the observatory web site after 7:00 PM on the evening of the Open House for a status report. 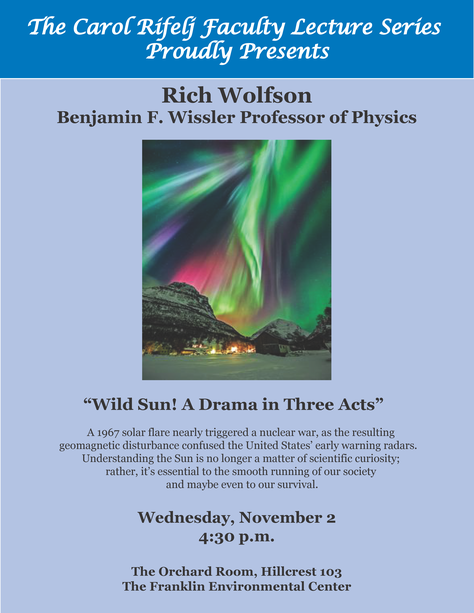 More information can also be found at http://sites.middlebury.edu/observatory/ . 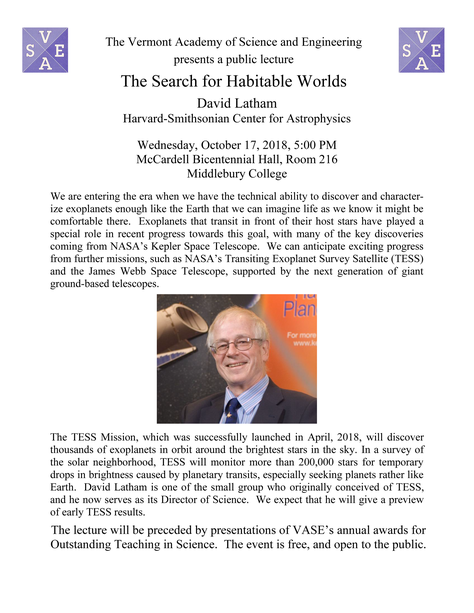 Observatory Stargazing – Autumn 2014 Open House NightThe Physics Department at Middlebury College will again host an Open House night at the College Observatory this fall. The observatory, located atop McCardell Bicentennial Hall, will be open to the public for viewing the heavens on Friday evening, September 12, from 8:00 PM until 9:30 PM, provided the skies are mostly clear.On this evening, Saturn and Mars will just be setting at the beginning of the event and the moon will just be rising at the end of the event. Also visible through our telescopes will be a number of interesting stars, star clusters, and nebulae. There is no set program for the Open House nights; the public is invited at any time between 8:00 PM and 9:30 PM. McCardell Bicentennial Hall is located on the western edge of the College campus. Follow state route 125 West from the Middlebury village center, through the campus. Approximately 0.1 mile past the flashing light at the crest of the hill, turn right at the base of the hill onto Bicentennial Way, which leads to the parking lot. Enter the building and take the elevators to the top (7th) floor. Observatory Stargazing – Summer 2014 Open House NightsThe Physics Department at Middlebury College will again host a series of Open House nights at the College Observatory this summer. The observatory, located atop McCardell Bicentennial Hall, will be open to the public for viewing the heavens on the following Wednesday evenings: July 2, July 23, July 30, August 6, and August 13, from 9:00 PM until 10:30 PM each evening, provided the skies are mostly clear.A highlight for the first few of these evenings, at least, will be the planet Saturn, with its ever-popular rings. Saturn and Mars will be prominent in the western sky, though both will become lost in twilight by mid-August. Also visible through our telescopes will be a number of interesting stars, star clusters, and nebulae. There is no set program for the Open House nights; the public is invited at any time between 9:00 PM and 10:30 PM. All the observatory public nights are free and open to the public, but will take place only if the sky is at least mostly clear. These are minimal language events, and students in all the summer schools are welcome. If the weather appears uncertain, visitors may call the observatory at 443-2266, after 7:00 PM on the evening of the Open House for a status report. More information can also be found at http://sites.middlebury.edu/observatory/ .